Eye floaters are often described by patients as tiny oddly shaped objects that show up and cloud their field of vision. Eye floaters are experienced differently dependent on the patient and as the person’s eye moves, he or she may see squiggly lines, black or grey dots, cobwebs and threadlike strands – to name a few examples. 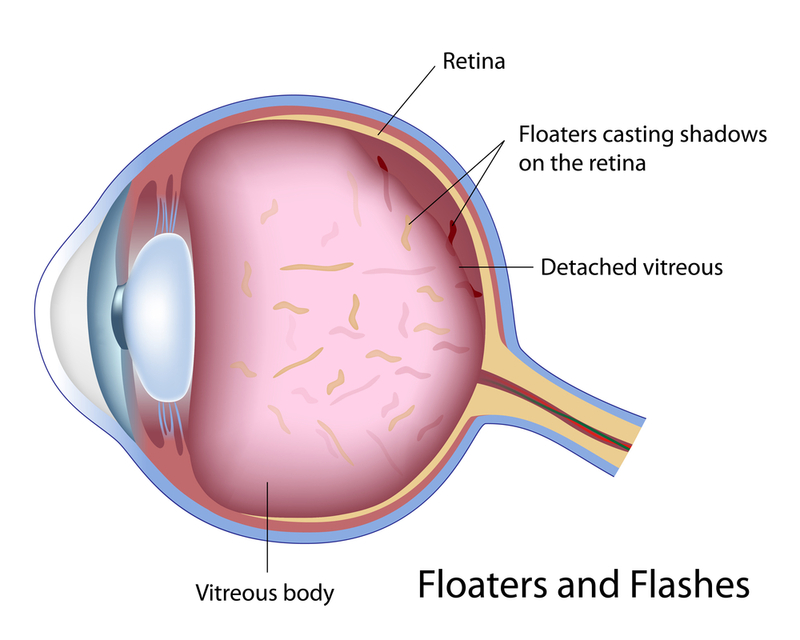 Floaters are actually small pieces of material that form in the vitreous – the clear fluid that fills the interior cavity of the eye. Floaters are usually clumps of condensed protein or cells, seen as small specks or strands moving into a person’s field of vision. Floaters are most apparent when a person is looking at a plain background such as a white wall or blue sky. The eye floaters can be seen because they create shadows on the retina, the light sensitive film at the back of the eye. Though not all floaters are serious, if you are experiencing a floater, please have a medical eye examination with our physicians at the Retina Health Center to ensure there is no damage to your retina. In most cases, floaters are part of the natural aging process. As people grow older, the vitreous shrinking causes the development of cloudy clumps of vitreous which are seen as floaters. This is common among those who are nearsighted or who have undergone cataract surgery. While they may interfere with clear vision, floaters usually present no threat to your eye and are more of an annoyance than a visual impairment. In some people the shrunken vitreous gel in the eye pulls free of its attachment to the back of the eye at the optic nerve. When this happens, a large floater is usually seen which can resemble a cobweb. This is frequently associated with the sensation of flashing lights as a result of the vitreous pulling on the retina. This separation of the vitreous from the back of the eye is called a posterior vitreous detachment. During this separation, tears can develop in the retina which can lead to a retinal detachment. Early detection and treatment of tears can prevent a retinal detachment. Floaters, particularly large floaters and/or large numbers of floaters, may be symptomatic of a more serious problem — bleeding into the vitreous cavity, a torn retina, inflammation or other problems — requiring immediate diagnosis and treatment by a retinal specialist. Benign eye floaters which are unrelated to retinal damage usually do not require treatment. They may actually disappear on their own over time or become more manageable to live with over time. Should an eye floater impair your vision, it is important to contact the Retina Health Center for an evaluation. Treatment options for more severe eye floaters include laser therapy, as well as a vitrectomy procedure. If you or someone you love has questions on eye floaters or light flashes in eyes, please contact Retina Health Center to make your appointment today.